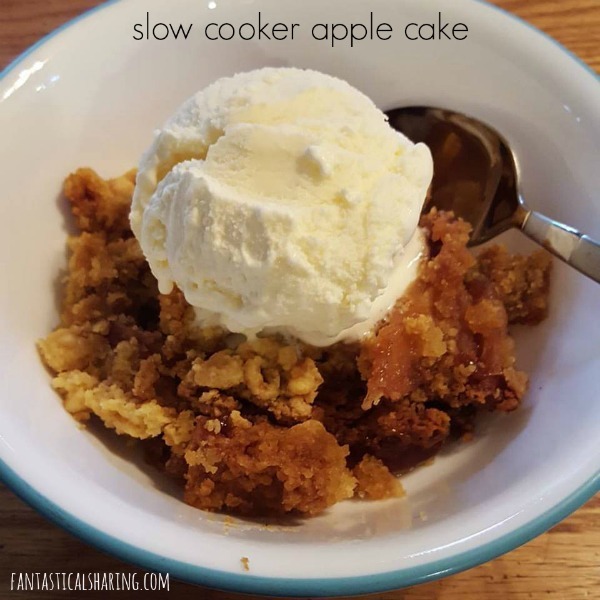 This wonderful fall dessert is made in the slow cooker and takes little effort to throw together! Slow cooker desserts are among my favorite thing because you can set them and forget them and you have a delicious dessert ready after dinner. This particular recipe for apple cake is perfect for late summer into fall. It's pretty much a dump cake because you just put all the ingredients into the slow cooker and cook it. There is not beating of ingredients and a crazy amount of preparation. It is simply tossing the apples with cinnamon and sugar, topping with cake mix, topping with melted butter, and cooking. This is a great dessert to make with children or for a potluck. You can even add some caramel sauce when you serve it up for a little caramel apple goodness! Layer apples in the bottom of a slow cooker. Top with brown sugar and cinnamon and gently stir to coat apples. Sprinkle cake mix over the top as evenly as possible but don't stir. Pour melted butter over the top but don't stir. Cover and cook on HIGH for 2 1/2 to 3 hours or on LOW for 6 hours. I love this Apfelkuchen aka German Apple Cake because it's not overly sweet, but buttery and dense, so it's perfect with a cup of coffee. If you are okay with making something that requires a teensy bit more effort, this Apple Cobbler from Buns in My Oven looks divine.